Welcome to another edition of these series. This edition is a timely one and I bless God we are all able to participate in this exercise. Before I go on, please if you have been blessed and have truly seen the hand of God upon your life and that of your family since you began this exercise, please bless another by sharing this with them. I remember praying for days for the Lord to give me a theme. October theme came together with September but For November, it was as though God had gone silent on me. “People are looking forward to this Lord, do not disappoint them”, was my prayer and he indeed answered. For those in Nigeria, the Federal Government announced that we are in recession. That is a fact. That is the truth but I choose to live by God’s truth. So without much story, we would be going straight to business. Key in, pray for yourself and your family members too. Find below 11 specific prayer points. Kindly read the Bible verses so you are praying with an understanding. Matthew 6:33. 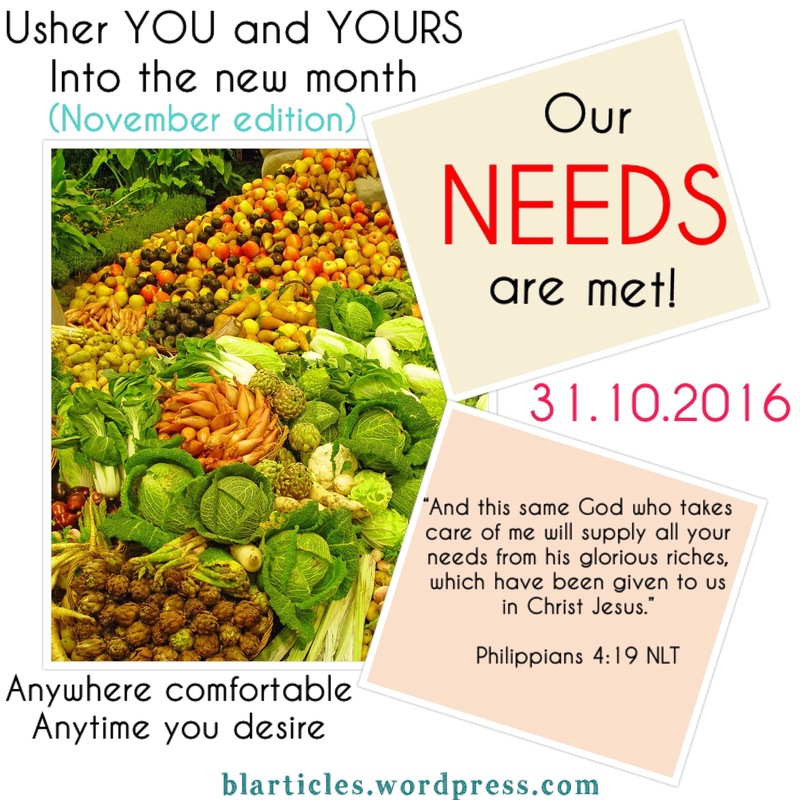 Father I(we) have come to seek you today, I(we) ask that all that I(we) will need in the month of November is ours in Jesus name. Amen. James 1:17. Father every good gift, everything that is perfect for me and my family. I ask that as I(we) call upon you today, you will hear from heaven and give them to me in Jesus name. Amen. Joel 2:26. Father every uncomfortable situation that this recession has brought to me and my family. I(we) rely on your promise of restoration and by faith I(we) receive all and more from you and I(we) will have all that we need and want in Jesus name. Amen. Psalm 65:9-12. Father you who showers the earth with rain and causes the grassland of the wilderness to flourish without anyone’s consent or approval, I(we) receive the rain of your blessings upon me and my family without notice and without anyone’s consent and approval in Jesus name. Amen. Deuteronomy 28:12. In this month of November and beyond, bless the works of my(our) hands. Send your rain upon my land (family-mention name). I(we) live by your word that I(we) shall not borrow but lend to many nations. Father give me(us) more than enough to not just lend but to give without expecting anything in return in Jesus name. Amen. Psalm 37:19. Father, my family and I will not be disgraced because we will have more than enough. Even when times are hard, we receive your overflow in Jesus name. Amen. 2 Corinthians 9:8. (Replace ‘you’ with your name/family’s name) Father I(we) receive your generous provision of all we need in this month of November and always. I(we) have everything I(we) need and plenty to share to others in Jesus name. Amen. When you read the story of Joseph and his brothers, The wisdom of God upon Joseph was the reason there was plenty in Egypt during the famine and this was where his family ate from. Father I(we) ask that you give me(us) godly wisdom to know how to save and prosper in the New month in Jesus name. Amen. Proverbs 3:9-10. Lord as I(we) sow in your house towards your kingdom, bringing in all our tithes and offerings. I(we) decree that I(we) shall not lack anything but live in plenty in Jesus name. Amen. Giving is a way of sowing too. It’s not right when you find out that those who demand your help (especially family members) do so to satisfy their wants meanwhile a need of yours was sacrificed. Father I(we) refuse to pay anothers’ debt brought about by lack of self control. I(we) refuse to satisfy anothers’ unreasonable wants. I(we) ask that they will not know our door steps. Disallow the devourers entrance into my(our) family. Give me insight to know when to give and when not to in Jesus name. Lastly, pray for yourself. Father while I(we) wait in the fulfillment of your word, I(we) will not be a burden to anyone and we will know when we truly need a thing or want a thing simply to show off. Take pride from us as you bless us in Jesus name. Amen. Pray all other prayer points for you and your family as you are led. Father for everyone who has prayed this prayers, all other requests raised to heaven and for those who couldn’t because of one thing or the other, we use ourselves as a point of contact to them and we ask that you do much more than they can imagine for them and their families in Jesus name. Amen. We will make our home, your home and according to Psalm 36:8, we will continually feast from the bounty of your house and drink from the river of pure joy this month and always in Jesus name. Amen. Father, we shall not be stranded, we will be lifted and stay lifted in Jesus name. Amen. God bless you and Happy new month in Advance. Remain in God’s love and Mrs O’ loves you big. God bless you so much sis. That our home will be God’s dwelling place. Thanks for these prayer bulletins and for being a blessing, sis. God bless you.